One of my leitmotifs for this year has been learning how to cook. I continue to be surprised at my capacity to cook healthy and tasty food for my family – real food from scratch ingredients, instead of assembled meals from prepared foods. This has had all sorts of benefits. There’s the ones I expected, like the fact that I know what’s in the food and I can control the ingredients and I can cut out huge amounts of additives and preservatives. And the fact that food is actually tastier, and the kids are more willing to eat it without argument. That much I could see coming. But there are other benefits, too. One is that even foods that I used to cook as part of the regular rotation now taste better. Chili seasoned with adobo peppers and onions and chili powder tastes so incredibly much better than chili seasoned with one of those flavour packs of sodium and dehydrated spices. Who knew? Another unexpected benefit is that (and this is really big) I actually like leftovers now. If you know me, you know how truly shocking this is. Me, eating leftovers. Go figure! Which brings me to the point of this rambly post. The nice folks at Rubbermaid were looking for bloggers to talk about their food storage boxes with Easy Find Lids (TM), and I was all over that. I love these things and waved my hand in the air to be selected for this campaign. I know, I know, the bloggy peeps are sure that I’ve finally lost it. (It being my mind, not the lids to my plastic containers.) Maybe, but with our busy life I am all about the short-cuts, the streamlining, and the simplifying. 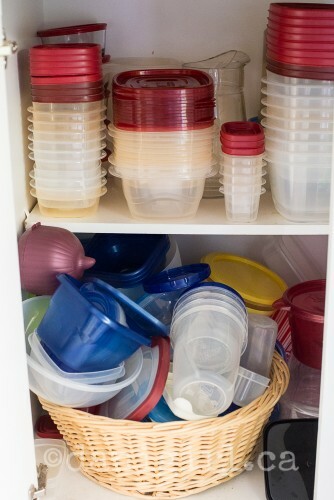 If my sanity is so tenuous that it rests in the balance between a teetering pile of tupperware that crashes out of the cupboard every time I open the door versus a neat pile of of carefully organized Easy Find containers and lids snapped together into a solid little tower, I’m okay with that. This is a not-staged, legitimate photo of the cupboard where we store plastic food containers. On the top shelf, growing collection of Rubbermaid containers with Easy Find Lids, and some semi-disposable Rubbermaid sandwich containers that have proved to be incredibly durable. Overflowing the basket that is supposed to contain them on the lower shelf is my rag-tag assortment of bits and pieces of non-Rubbermaid food storage devices I’ve tried through the years. I’m afraid to dig in the pile because it will take me forever to sort and restack the lot of them. If I wasn’t such an inveterate packrat and container collector, I’d have pitched the lot of the precariously piled mismatched containers ages ago. So, TL;DR: Rubbermaid Easy Find Lids (TM) snap together and attach to bottoms of containers. No teetering piles of mismatched pieces! They have graduated sizes so you only need to use a container as big as you need. No need to take up extra room in the fridge or cupboard. Multiple sizes of containers can share one lid size. And they’re microwave, fridge, and – be still my heart – dishwasher safe. Because ain’t nobody got time for handwashing anything! Disclosure: I am part of the Rubbermaid Blogger Campaign with Mom Central Canada and I receive special perks as part of my affiliation with this group. The opinions on this blog are always my own. Next post: Photo of the day: Hey in there, can I come in?